Why Buy LED Replacement for T8 light bulbs? 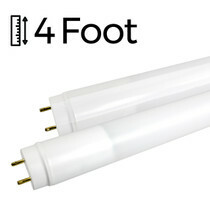 Efficiency - Replace your existing fluorescent bulbs with LED T8 tube lights and enjoy 55%+ savings on electricity consumed. Lifespan - LED T8 tubes last up to 3 times longer than traditional fluorescent and require less maintenance. Light Quality - Higher quality light output with low glare and higher rating on the color rendering index (CRI). An LED replacement for T8 Tube Lights can be installed with ease into existing sockets by removing or bypassing the existing ballast. 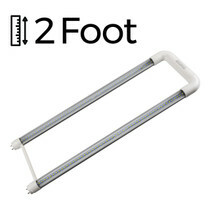 A thick AL circuit board enclosed in a clear PC tube and an Aluminum extruded back heatsink give these T8 replacements the durability and quality that our customers have come to expect from our products. Brilliant Brand LED Lighting LED replacement for T8 bulbs include a 2 year manufacturers warranty. SMD LEDs transfer heat better than standard fluorescent bulbs which increases their working life. 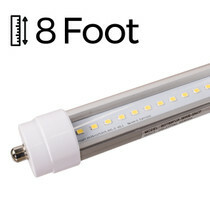 These LED T8 Tube Lights contain NO MERCURY, emit NO RF interference and are manufactured under ROHS. Click for information regarding the energy savings of LED T8 Replacement Bulbs. Do I have to be an electrician to bypass existing ballasts? No! Bypassing your existing ballast can be done without an electrician by following our easy installation guide. Where can I find information on financial incentives? Numerous financial incentives are available when you upgrade to tube lighting with LEDs. Call your local power company to learn about the existing programs in your area. Do LED T8 Replacement Bulbs strobe or flicker? 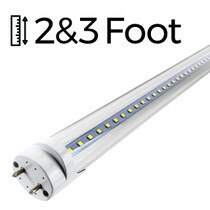 With SMD LED technology, LED tube light bulbs are able to produce a consistent light with no flicker or strobe. Additionally, LED T8s offer instant-on illumination even in extremely cold temperatures.